Add stylish looking tables to your living space and jazz up the décor of your home. Go for an elegantly designed coffee table set for your patio or balcony. Pair your comfortable recliners and sofas with side tables for a balanced and subtle appeal. Get console tables to dispaly your books, family pictures or souvenirs you've collected during your travels. Coffee tables are central to most living rooms. They are great place to set drinks or prop your legs up after a long day. At Urban Ladder, you'll find a wide range of coffee that provide storage options and coffee table sets that provide seating options as well. 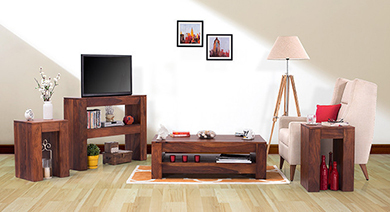 You are assured sturdy and reliable furniture pieces to accentuate your living room. Urban Ladder is the perfect place to buy coffee tables online as we have a large selection of living room furniture, so you can find a piece that's perfect for your home. Want to create the ultimate liveable space or the best corner to study? Browse an unbeatable selection of tables including study tables, all available at the best prices in India. From buying furniture that can be pulled into the corners of the room, or offer space-saving options, you can do a whole lot more on Urban Ladder. Do you agree that your living room is one of the most lived and loved sections of your house? Are you inspired to create a dream living room? Don't forget to add important furniture accents such as coffee table, study table, console table or bar unit. 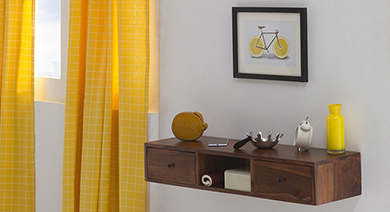 Add style to your home by finding furniture pieces that are a great option to serve or stock your favourite beverages. Urban Ladder offers the widest selection of tables including coffee tables, study tables, console tables, side tables and more online.